Home / Life at the Manor / Bwock. Bwock Bwock. Part 2, now with pictures! Bwock. Bwock Bwock. Part 2, now with pictures! HENS! They came out for the day and are picking through their new pen. They find me slightly alarming, so I forsee lots of sitting quietly in the chicken pen in my future. To the left outside the chicken enclosure is Noodlehead’s winter home. She was living in the chicken enclosure when it was old and decrepit, and since it is now closed off to her I thought she should have a nice house for winter. So we got a huge plastic bin, and lined it with straw, and then I stuck her old small plastic bin in it and lined THAT with straw, and it’s in a spot where it will get some sun and be nice and toasty warm for her. Although she’s been hanging out on top of the chicken enclosure. Anyway, the hen on the left is obviously the one that is either an Australorp or a black copper Marans. We will have to see what color egg she lays before we have a good guess between the two breeds. 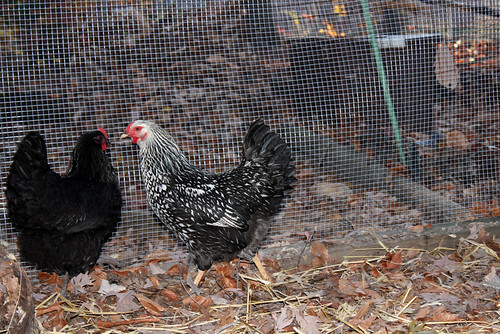 To the right is the silver-laced Wyandotte hen. Aren’t they gorgeous? These guys (and chickens to come) are my answer to the horrifyingly inhumane factory farming conditions in the US. Even “cage free” chickens are kept in over-crowded conditions, often with minimal access to sunshine and fresh air. Because of the overcrowding, they will attack each other, so the tips of their beaks are cut off to keep them from damaging other chickens. This is no way to treat a chicken. The best laying productivity of commercial breeds of hen happens at around 18 months, and when productivity starts dropping off, they’re killed, never having gotten to pick through leaves for bugs or gotten a chance to scratch up their own dust bath spot or bask in the sunshine and enjoy the breeze. My hens will be with me until they die a natural death. It may mean a drop-off in available eggs, but whatever. They will get to forage around and be chickens, and have enough space to get away from their flock-sisters if they feel like they need some alone time. 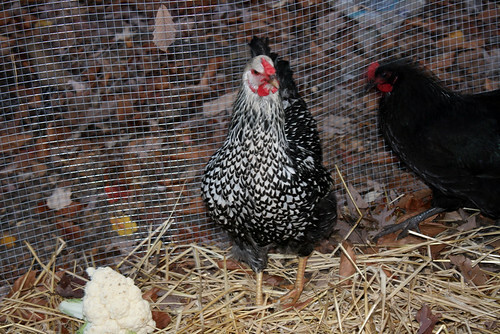 Also they will have names, and be known chickens who are adored for their chickeny selves. And I will have eggs that do not make me feel like a jerk. I realize some of my vegan gentle readers will tell me it’s still wrong to take their eggs, and I respect them and their views. Vegetarianism and veganism remain on the table for me, but for the moment, this is a good deal. I’d like to think the chickens think so, too. I still really would LOVE to get chickens here, Jeffy is not exactly thrilled by the idea though – the piggies are a lot of effort right now. This vegan reader is cool with it, especially if many pictures of them being chickens will be forthcoming. And especially especially if you plan on handing them back some of the shells and/or eggs as necessary to keep their bones strong and healthy. Ooooh, aren’t they a pretty bunch!